GPSLogger uses the GPS capabilities of your Android phone to log coordinates to GPS format files at regular intervals. This can be particularly useful if you want to geotag your photos after a day out or share your travel route with someone. The purpose of this application is to be battery efficient to save you battery power when abroad and last as long as possible. Use the views dropdown to navigate between the different presentations. While you are logging, the green indicator will stay on. The spinner only appears when the GPS is trying to get a fix. Profiles - Group preferences under profile names, such as default, nighttime, trekking, etc. Distance travelled is the total distance between all points. Can log to GPX, KML, CSV, NMEA and CSV formats. Can also log to a custom URL or just the screen. Automatically upload or email the file at set intervals to destinations such as Email, FTP, Dropbox, Google Docs, OpenStreetMap. Invoke operations from Tasker or other automation apps. Why is it taking so long to find a fix? There can be several reasons reasons for this. New location - if you are at a new location after a long flight, the GPS on your phone can take a while to reorient itself. Try running GPSLogger at high frequency until it does find a location. Interference - there may be structures nearby blocking your signal. Mid flight - if you are in a commercial aircraft, you are probably traveling too fast for your phone's hardware to keep up with the GPS signals. Why are the fixes sometimes inaccurate? It all comes down to your hardware, settings and environment. The accuracy is only as good as your phone's GPS chip. Some phones may have 4 meter accuracies, some have 500 meters. Also, using GPS satellites will give you better accuracy but take a longer time; using network location will give worse accuracy but is quicker. You may also want to check your environment, as there can be inaccuracy due to clouds, buildings, sunspots, alien invasion, etc. Sometimes your specified time interval will have passed, but no point was logged. There are a few reasons this could happens. On Android 6+ (Marshmallow), a new feature called doze mode was introduced, which severely restricts activity on the device after certain periods of inactivity. You can choose to whitelist GPSLogger which does not bypass doze mode but occasionally provides logging windows in which to work. It will not make a great difference though, doze mode is quite aggressive. The accuracy was below your Accuracy filter settings, or the distance was below your Distance filter settings, so GPSLogger didn't log it. You can try setting a retry interval in which GPSLogger can wait for a more accurate point to show up and then use it. Or you can allow for slightly more inaccurate fixes - your mileage may vary as every phone is different in terms of how accurate a fix it can get on a regular basis. It's using the wrong timezone, can you make it use my timezone? The standard when logging points is to use UTC. Since this is the standard, it would be wrong to use the the local time zone, the file is considered invalid. Instead, it is the responsibility of the software you use the log file on (Google Earth, GeoSetter, etc.) to adjust for your timezone. Any application that deals with GPX or KML files will have a setting that allows you to specify your own timezone. I am displaying imperial units but why isn't it logging imperial to the file? What are the units in which the values are logged? When logging to file, the units are always in SI units - meters and seconds. 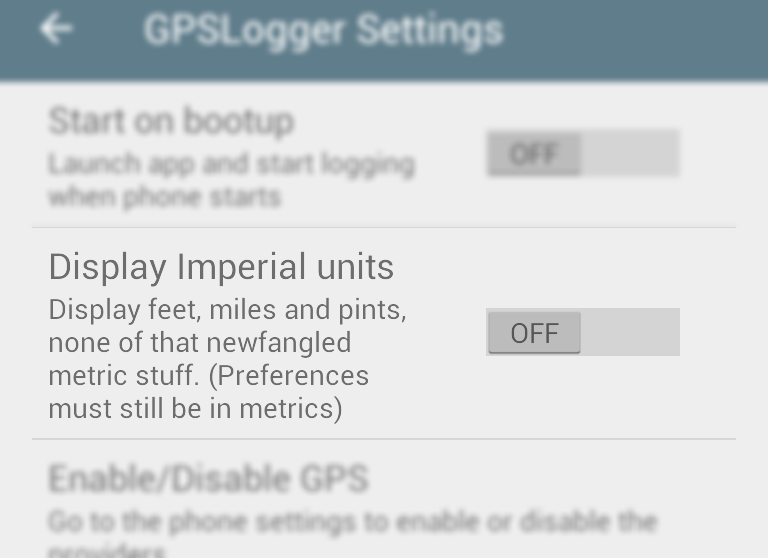 Any imperial units are only for display purposes and nothing else. The same applies for times and distances which may appear as km/h or m/s - these are purely for display. Where is the file being logged? How do I get to it? What is the default folder path? The initial part will be different for your device. If you have a file explorer installed, you can click on the folder paths in the simple/detailed screens. To copy the GPSLogger files, you can connect your phone to your computer and mount the SD card, then copy straight from the above folder. You can also change the default folder in the app settings. Finally, note that due to the restrictions introduced in Android KitKat, any files in the default folder will be removed if you uninstall the app. How to log to an external SD card? Note that GPSLogger can only write to its application folders. File explorers are able to write to any location but they make use of a special media hack which this app cannot rely on. If the app is logging, and you make changes to the settings, the changes will take effect after the next point is logged. This means that if you've set your interval as 1 hour, you have a long wait ahead of you. If you want the changes to take effect immediately, then stop logging and start it again so that the changes are refreshed. Logging interval - How long to wait after a point has been logged to try logging again. Distance filter - When a point becomes available, the app will check to ensure that this much distance exists between the previous and current points. If it isn't this distance, the point is discarded. Accuracy filter - When a point becomes available, the app will check to ensure that this point has a minimum accuracy specified. If it does not match the specified accuracy, the point is discarded. This is useful if you are inside a building for a while. Duration to match accuracy - When searching for a point, the app can continue searching for this many seconds until it finds a point that meets the accuracy and distance filter criteria above. Absolute timeout - When searching for a point and trying over and over, the app will give up when this timeout is reached. This is useful for when you're inside buildings, GPS tends to keep searching and finding nothing. Keep GPS on between fixes - Normally, the app stops using GPS between points, to save battery. This means when it's time to log the next point, the GPS needs to be 'woken up' again and this takes a little time. Keeping GPS on between fixes causes this 'wake up' time to be reduced. Don't log if I'm not moving - Some Android devices have motion sensors. If you enable this setting and the motion sensors indicate that you have stopped, then GPSLogger will not log any points for your logging interval, even if you start moving before then. How do I make the app last longer? Are there any recommended settings? Mainly, turn wifi off, turn mobile data off, turn background synchronization off, turn bluetooth off. If you turn mobile data off, you'll probably want to inject aGPS data regularly, there are apps that can do it for you. You can also try going into airplane mode which turns many things off. When it comes to choosing between location sources - GPS vs network - GPS will be more battery hungry, but has better accuracy; network location is easier on the battery but isn't as accurate. For time intervals, consider using 60 seconds or more. It's how the Android OS has implemented its GPS system. When you say you want a point every 60 seconds (for example), that's actually a suggestion rather than an imperative, and so the time interval between GPS points is never guaranteed. 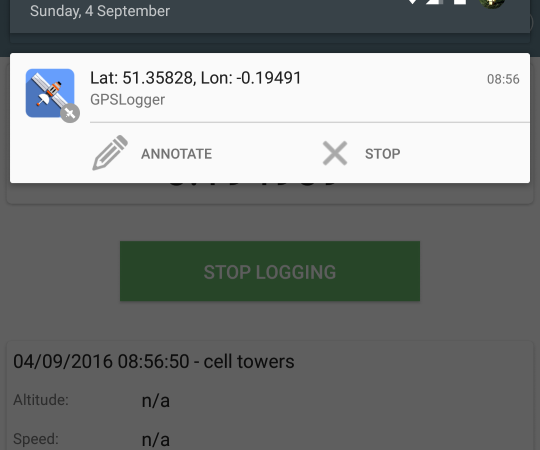 GPSLogger has logic that checks the time difference, though, and will make sure that at least 60 seconds have passed before logging again. It is not meant for sub-second logging, as that will require aggressive wakelocks. Why can't I remove the notification? As of newer versions of Android, removing the notification will cause the service to be killed. As a result, the notification now needs to stay there. You may have seen a recent increase in the number of apps that need to sit in the notification bar for the same reason - to perform background services without being killed. There is an option in the app's settings that allows you to remove the notification buttons if you want a smaller notification. What settings are required for task managers? Task managers don't like GPSLogger and will frequently kill the service. How is this different from other logging apps? It's meant to be more battery efficient. A lot of other apps, such as MyTracks, usually go with the assumption that you have a data connection available and your routes won't be very long. They use CPU wakelocks and log points extremely frequently with high accuracy. The aim of GPSLogger is to log points and stay quiet. To put it another way, MyTracks or similar are better suited for runs; GPSLogger is suited for days out, hiking, photography. How does this integrate with Tasker/Llama or other automation frameworks? If your automation app can send intents, you can use those intents to control GPSLogger and get it to perform a few actions. To invoke it from Tasker, create a new action under Misc > Send Intent. The app comes with a Start and a Stop shortcut (long press home screen, add widget), you can invoke those from some automation apps. (Experimental feature) GPSLogger sends a broadcast start/stop of logging, which you can receive as an event. In a custom application, receive the com.mendhak.gpslogger.EVENT broadcast and have a look inside the extras. How can I define a preset file with my own values? Many people actually distribute GPSLogger to colleagues preinstalled on phones, with some preset values. If you create a file in the default folder or at /sdcard/gpslogger.properties, then GPSLogger will read this file each time it loads and apply those settings to the application. For example, in the file you can put accuracy_before_logging=42 and that will reset the Accuracy Filter to 42 meters each time the application starts. There are many properties that can be applied and you can glean a full list here. The most common examples of properties would be log_gpx, log_kml, time_before_logging, opengts_* for OpenGTS settings, smtp_* for email settings. The Custom URL feature allows you to log GPS points to a public URL. This can be a third party API that accepts GET requests, or an application that you've written and are hosting on your own server. If your phone goes offline, then the app will queue these requests until a data connection becomes available. You can add your HTTP body, HTTP header, HTTP method and basic authentication credentials in the Custom URL screen. If you use a self signed SSL certificate, be sure to validate it first. How can these GPS log files be used? How do I geotag photos with a GPS log file? The GPS files produced by this app are generally used for processing other things. A common use case is to geotag photos. Many cameras, especially SLRs, don't have built-in GPS. After a day (or days) out of photography, you may have hundreds of photos that need to be geotagged so that their locations can appear properly when used elsewhere. There are of course other uses of the produced files, these are a few I've seen over the years; it's usually a combination of a log file produced from GPSLogger with a secondary software to process the files. Tracking of geocaches, gravestones, repair sites, etc. There is a project that can expose the GPX files in Dropbox as a RESTful API, and a hosted Heroku app. Can I use your app in a research project? This is actually the most commonly asked question! Yes, feel free to use GPSLogger in your research. The source code is available on Github if you want to dig through it. Feel free to link back to the Github repo for credit/citation. Profiles are basically different settings, grouped under a name. For example you can have a night profile and a trekking profile with different logging frequencies, and switch between the two when you need to. Tap the profile header and then "Add profile" to create a new profile. The new profile will have the same settings as the one you're currently on. You can then modify a few settings and those should be specific to your new profile. Conversely, any settings you change in one profile won't automatically be saved in other existing profiles. It is recommended that you do your basic setup in the Default Profile first. You can delete a profile by long pressing it. Sometimes the app might not behave in an expected way. You can troubleshoot it yourself by going to General Options and enabling the Write to debug file option. Next, reproduce the behavior or problem, and this creates a debuglog.txt file in the GPSLogger folder. You can then grab the file off your phone and have a look through it, or email it to yourself from the same screen (Attach debug log to email). Be sure to turn it off afterwards as this file grows very fast. If you use self signed certificates or custom CA certificates in Custom URL, OwnCloud, OpenGTS, FTP or SMTP then you will need to get GPSLogger to recognize and store your custom certificates. It's easy. Just go into a setting screen where you have specified a custom SSL URL or server, and click Validate SSL Certificate. You will be prompted with the certificate's details, you can then choose to accept; the certificate will be stored in the local keystore. This validation is required as it's a security best practice. It helps protect your information between your device and the server, it prevents attackers from listening in. The Google Play Store is also asking developers to be stricter with SSL based verifications. In the case of OwnCloud, OpenGTS and Custom URL, the certificate must match the domain you're connecting to. In other words, if your certificate is issued to example.com then the URL you are connecting to must match example.com. More specifically this means that the certificate Common Name or Subject Alternative Name must match the host of the URL you are connecting to. Why does GPS drift when I am stationary? Why does my GPS speed sometimes show massive spikes? This is normal with GPS receivers, especially in areas where there are objects nearby (trees, people, buildings, mountains). GPS receivers receive their signals over multiple paths. The main path of course is the satellites themselves, but it also receives signals due to reflection off those nearby objects. The receiver now sees more signal sources than are actually present and based on various algorithms, chooses to believe one of them. Due to the reflected signals, the distance and clock offset from the satellite also differs and the calculation based on this is now slightly incorrect. Considering that there may be several satellite signals being reflected, the overall outcome is the GPS drift that you see. To deal with this you can either include a distance filter in the performance settings, or you can try the activity recognition setting so that it doesn't log when you are still. For more details on multipath, see this page. Logging to SMS (and email) is a frequently requested feature, however this has not been implemented for a few reasons. While logging can be set to be frequent (~1 second), sending an email or SMS every second would get this app banned very quickly and is also likely unsafe for the user. Although this could be mitigated by implementing specific logic to not allow SMS and emails to be sent so frequently, this would dramatically increase the complexity of the code and the flow of logic. Can you implement a specific feature? Please note that I work on GPSLogger in my spare time and I may not always have the time or resources to implement a feature. However, GPSLogger is open source. You are encouraged to contribute or get someone else to contribute a feature. It's also worth mentioning that not every feature request can be catered to; every request is evaluated through the lens of whether it would benefit the majority of users, or whether it is an edge case specific to the submitter. You can submit your feature requests on Github. 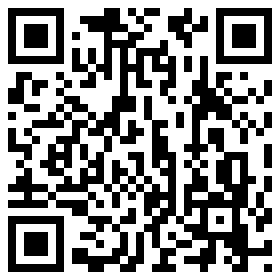 Search for GPS Logger for Android in Google Play, or follow this direct link. You can also download the APK directly here. Submit your feature requests on Github.